Humidifiers vs Vaporizers: Do You Know The Difference? If you have ever been told by a physician or pharmacist to use a humidifier or vaporizer in your home, you may be one of the many Americans wondering what the difference is between these two devices. Although they may seem somewhat similar, there are distinct differences that put each machine in a class of its own. Whether you are suffering from a respiratory condition, live in an extremely dry climate or simply want to enhance your ability to breathe, you may want to read up on the basic differences between vaporizers and humidifiers. Cool mist humidifiers add moisture or humidity to the air and are often used by people who live in dry climates or who are suffering from flu and cold symptoms. These moisturizing machines are a great appliance that can help to alleviate sinus headaches, sneezing, dry skin and coughing, and are especially helpful when used during the cold and dry winter months. Humidifiers can also bring much-needed relief to children who are suffering from frequent bloody noses caused by dry mucous membranes. 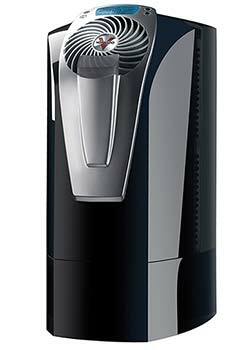 Humidifiers produce water vapor using a disk that rapidly turns while submerged in water. Cold vapors are emitted, so there are no burn risks associated with humidifiers. 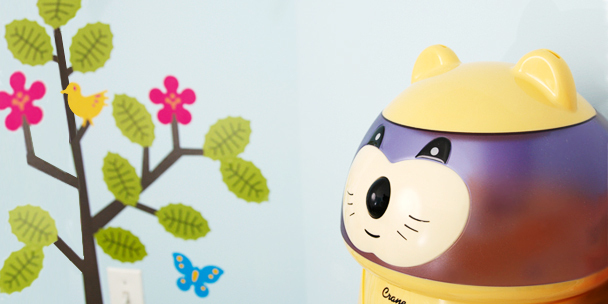 This makes humidifiers perfect for children’s’ rooms; however, it is crucial to speak to your pediatrician before using a humidifier around your child. Distilled water should be used. Since the water is not heated, there is the possibility that bacteria or mold could spread through the air. No medications or inhalants can be added to humidifiers. Humidifiers are noisier than vaporizers. Most types of humidifiers have wick filters that need to be changed every few months, depending on how often you use your machine. The wick filter is designed to slow mold growth and absorb any minerals that are found in the water source. 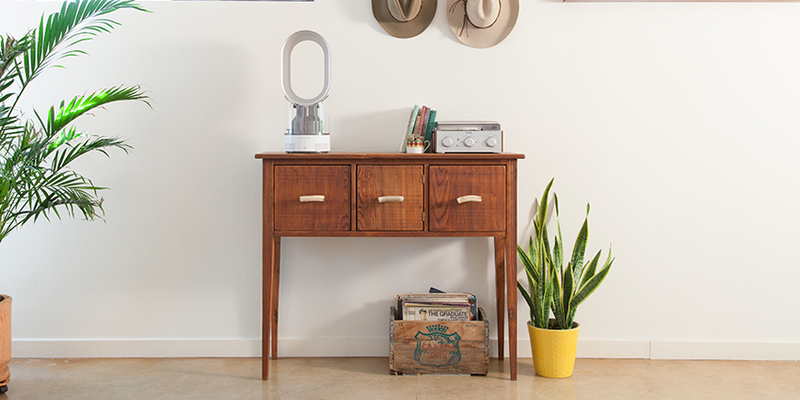 Humidifier machines that do not have filters may dispel a fine white dust. Central / Whole House Humidifiers — This type of humidifier can be installed directly into a home’s central heating system and work to increase the moisture content in the entire house. Everything is done automatically. Warm Mist Humidifiers — Ideal for cold living environments, this type of humidifier helps add moisture to the air while increasing the ambient temperature within the room. 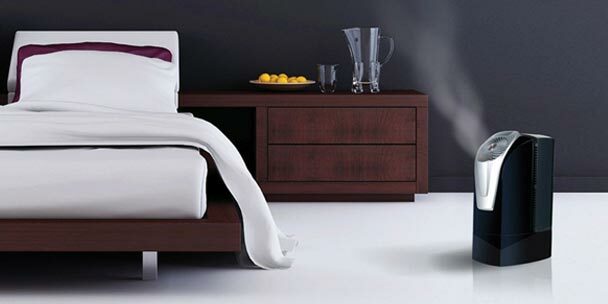 Cool Mist Humidifiers — Ideal for anyone that is suffering from flu or cold-like symptoms, this type of humidifier helps add moisture to the air without increasing the temperature of the room. 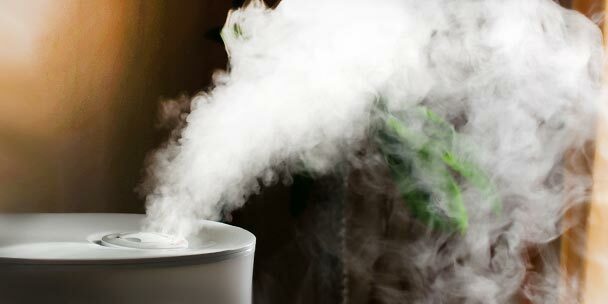 Ultrasonic Humidifiers — These quiet machines use high frequency sound waves to produce vapors. Evaporative Humidifiers — While most humidifiers are not air purifiers, the evaporative variety can capture pollutants and minerals that are floating in the air. 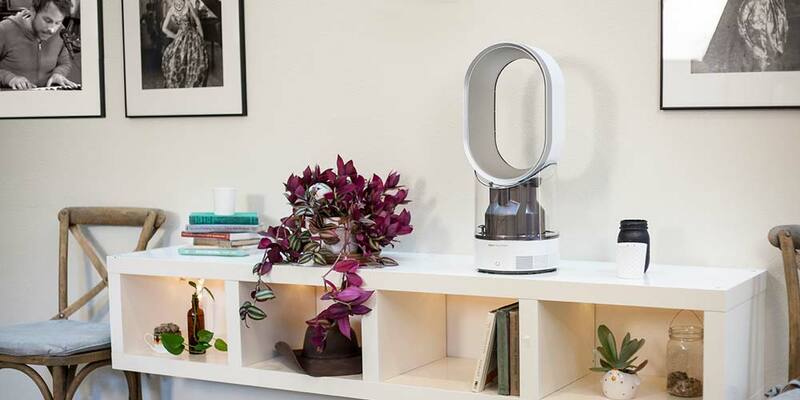 This cleans the air in the home while adding essential moisture. Unlike humidifiers, vaporizers can be used to deliver medication and relieve common cold symptoms. Additionally, because vaporizers utilize heat to boil the water and release steam, it is less likely that you will spread mold and bacteria throughout your home. Vaporizers use a heating element to boil water, which then lets off steam. These devices emit hot steam, which can help to warm up a room in the cold winter months. However, this also presents a significant burn threat to small children and pets. Tap water is okay to use with vaporizers, since the water is heated. The boiling process will kill any bacteria or mold that is present. Additives, including essential oils, medications and inhalants, can be added to the water of the vaporizer. The vapors will then contain the additive, which can be easily inhaled by the person using the device. Typically, vaporizers are quieter than humidifiers. While dry air can cause discomfort, air that contains too much moisture can create the perfect environment for mold, bacteria and mildew growth. Experts suggest that the optimal humidity level in your home should be between 25 and 55 percent, depending on your personal preferences. If it goes higher than that, you will likely need a dehumidifier to help remove some of the moisture. Both vaporizers and humidifiers should be cleaned thoroughly after every use. Failure to do so may lead to bacterial contamination of the filters or water basin, which can then release harmful toxins into the air. Always use distilled water to avoid hard deposits from forming inside of your water basin. Clean humidifiers after every use or every three days. If your machine has sat unused for three days or longer, be sure to clean it out before you use it again. After unplugging the machine, gently remove any mineral deposits that may have accumulated along the sides of the water basin using a 3 percent hydrogen peroxide solution. Be sure to rinse the water basin well after cleaning it with the solution to avoid having left over chemicals become vaporized and airborne when you use it next. Never let water sit in the machine for an extended period of time when the device is not being used. Mold will start to accumulate quickly. Change the filter as directed by the manufacturer. Every brand is different, so be sure to refer to your owner’s manual. Keep an eye on the immediate area around the humidifier or vaporizer. If any windows, tablecloths or carpeting becomes damp around the machine, adjust the settings to avoid too much moisture and possible mold growth. 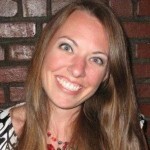 Are there children present in the home? Do you have to worry about them getting burned? How often are you going to use the device? Is your air chronically dry or is the dryness seasonal? 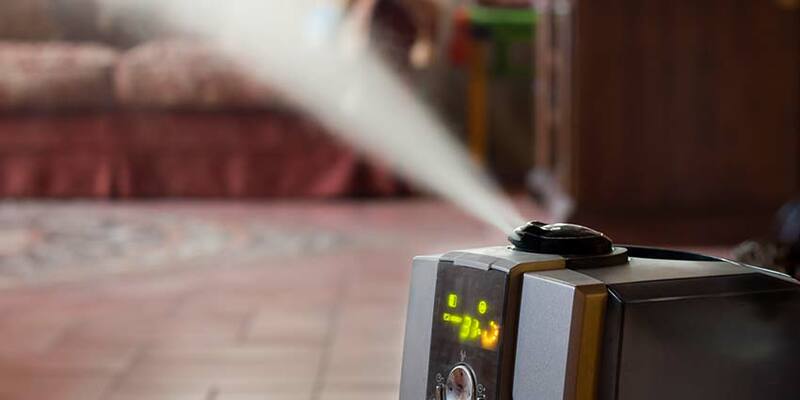 Are you able to keep up with the stringent cleaning requirements of a humidifier or would you be more comfortable knowing that a vaporizer’s hot steam will naturally kill any bacteria that may be present? Do you personally prefer cool mist or hot steam? Would you like to use medication with your vaporizer, such as menthol or other essential oils? If you are like many Americans, keeping your home comfortable and healthy is one of your main priorities. Consider adding a humidifier or vaporizer to your home as a way to improve your quality of life. one important, perhaps the most important factor above all is that low humidity levels under 40% are dangerous. especially with electrical systems causing them to spark with static. under the right conditions, this can start home fires, especially when using a dryer.